Inventory We are a resale marketplace, not a box office or venue. Ticket prices may exceed face value. This site is not owned by American Airlines Center . 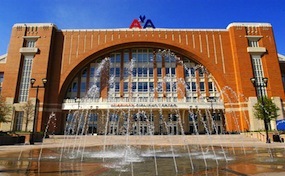 The American Airlines Center opened July 17, 2001 on 2500 Victory Avenue right in downtown Dallas, Texas. The American Airlines Center is home to the Dallas Mavericks of the National Basketball Association and the Dallas Stars of the National Hockey League. The AA Center, as it is sometimes known, was built on a construction cost of $420 million and has a capacity of over 21,000 for concerts. The American Airlines Center box office has played host to some big events like the NBA All-Star Game, NBA Finals, the NHL All-Star Game, UFC 103, PBR, and the WWE. American Airlines Center tickets draw the biggest attractions in the Dallas/Fort Worth metro area. The facility was designed by David M. Schwarz Architectural Services of Washington D.C. American Airlines Center was built to be the center of an urban area of Dallas, Texas called Victory Park. The building is laden with brick and arches to give a simple, yet robust feel to Dallas, and has been awarded a multitude of times for its architecture. Center-Dallas.com is a privately held company that specializes in the sale of tickets in the secondary market. We are not affiliated with any official supplier, website, or box office. Prices on all of our websites may fluctuate above or below face value and have a tendency to change quickly with demand. To purchase tickets to any American Airlines Center in Dallas events simply call our operators at anytime or click on the event you wish to attend.